Teferi Abate Adem holds a Ph.D. in Anthropology (Boston University 2000), M.A. in Social Anthropology (Addis Ababa University, 1993), and B.A. in Sociology (Addis Ababa University, 1987). In addition to working on eHRAF World Cultures, Teferi has been involved in HRAF’s multi-year cooperative project with George Mason University on modeling pastoral conflicts in Eastern Africa. 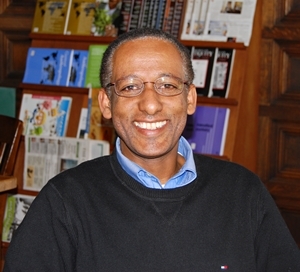 Prior to joining HRAF, he was a visiting professor of international development and social change (IDSC) at Clark University, a postdoctoral fellow at the Program in Agrarian Studies (Yale University) and Assistant Professor at Addis Ababa University where he served as Chair of the Department of Sociology and Anthropology. Teferi’s research interests encompass a variety of historical and comparative themes at the intersection of agrarian change, natural resources management, institutions for mutual help and collective action, and household and community level effects of state powers and global markets. Adem, Teferi A., Carol Ember, Eric C. Jones, Ian Skoggard and A. J. Faas, (in press). “Dangerous Geography: Spatial Distribution of Livestock Raiding in Northwestern Kenya”, (accepted for publication in Ethnology). Adem, Teferi Abate. 2012. “The Local Politics of Ethiopia’s Green Revolution in South Wollo.” In African Studies Review, Volume 55, Number 3 (December), pp. 81–102. Ember, Carol R., Teferi Abate Adem, Ian Skoggard and Eric C. Jones, 2012. “Livestock Raiding and Rainfall Fluctuation in Northern Kenya, 1996-2009”. In Civil Wars, Vol. 14, Issue 2, pp. 159-181. Ian Skoggard and Teferi Abate Adem. 2010. “From Protectors to Predators: The Filial Disaffection of a Turkana Age-Set”. In Ethnology, Vol. 49, No. 4, Fall 2010, pp. 249-262. Adem, Teferi Abate. 2004. “Decentralized There, Centralized Here: Local Governance and Paradoxes of Household Autonomy and Control in Northeast Ethiopia”, 1991-2001. In Africa (Journal of the International African Institute), vol. 4, no. 4, pp. 611-632. Adem, Teferi Abate. 1998. Land, Labour and Capital in the Social Organization of Farmers: A Study of Local-level Dynamics in Southwestern Wollo. Addis Ababa University Press. Adem, Teferi Abate. 1997. “Land Redistribution Program and the Micro-Dynamics of Land Access and Use in Amhara: The Case of Two Communities in South Wollo”. In Katsuyoshi Fukui, Eisei Kurimoto, Masayoshi Shigeta (eds. ), Ethiopia in broader Perspective: Papers of the XIIIth International conference of Ethiopian studies, Kyoto: Shokado. Adem, Teferi Abate.1995. “Land Redistribution and Intra-Household Relations: The Case of Two Northern Ethiopian Farming Communities.” In Ethiopian Journal of Development Research. Vol.17 (1). pp. 23-42. Adem, Teferi Abate.1994. “Land Scarcity and Landlessness in Northern Shewa: A Case Study from Wayu and Anget Mewgiya PA.” In Land Tenure and Land Policy in Ethiopia after the Derg, Dessalegn Rahmato (ed), pp. 93–115. Addis Ababa University Press.